Home » Caretaking » 4-22-2017 CRC Streams Cleanup on Earth Day! 4-22-2017 CRC Streams Cleanup on Earth Day! 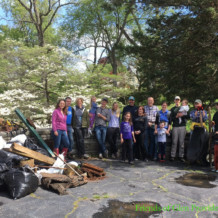 Friends of Glen Providence Park is proud to be helping the Chester-Ridley-Crum Watersheds Association (CRC) with their 20th Annual Streams Cleanup, on Earth Day this year! CRC volunteers will remove trash at more than 30 sites along Chester, Ridley and Crum Creeks and their tributaries, including Broomall’s Run in Glen Providence Park. The Annual Streams Cleanup is just one of many activities that CRC undertakes to further its mission “To protect, conserve, and restore the natural resources of the Chester, Ridley, and Crum Creek watersheds.” This is our sixth year coordinating the CRC Streams Cleanup for Glen Providence Park. Meet at the Glen Providence Park main entrance on West State Street in Media at 9:00 am. Gloves and bags will be provided. We recommend long pants and long sleeves to protect against poison ivy and ticks. If you’d like to tackle trash along the streambank, wear water shoes, boots, or old shoes! CRC requires that volunteers sign a liability release. Complimentary food, fun, and games for everyone! 10-6-2018 National Public Lands Day: plantings & cleanup! Canopy Tree Plantings for Earth Day!